8116ARCTIC SUMMITS! A backcountry ski guide to some of the finest coastal mountains of Northern Norway. 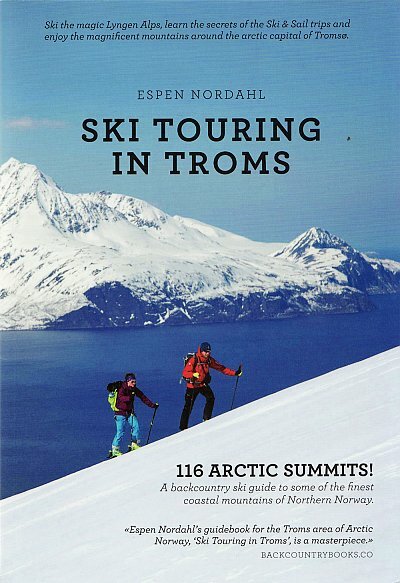 SKI TOURING IN TROMS is a guide book to 116 mountains in the Norwegian county of Troms. 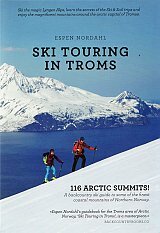 TOPPTURER IN TROMS, the original version published in Norwegian in 2010, is already a classic. The book covers the areas of Malangen, Kvaloya, Ringvassoya, Mainland Tromso, Balsfjord, Tamokdalen, the Lyngen Alps, the Kafjord Alps and Uloya. The magical combination of sea, snow and steep mountain sides now attracts lots of enthusiasts for the guided Sail & Ski trips. Descending powder slopes in the evening sunlight is a memory for life. The ultimate arctic ski experience is just as available for the individual ski adventurer. Take a quick afternoon trip from the city of Tromso to Lille Blamannen, or try an expedition to Jiekkevarri with its glaciers and alpine terrain - Troms offers something for all tastes. The book gives detailed descriptions of ascents and descents, for the beginner as well as for the expert. All the trips include aerial photos with routes indicated. Each chapter ends with an overview map (1:250 000) as well as individual maps for the summits (1:50 000). The book also includes more than 140 pictures. There is a chapter on avalanche safety written by avalanche expert Kjetil Brattlien, as well as a chapter on ski history written by mountain guide Ake Hedlund.